The lifeblood of your business is repeat customers. But customers can be fickle, markets shift and competitors are ruthless. So how do you ensure a steady flow of business? The secret - no matter what industry you're in - is finding and keeping automatic customers. These days virtually anything you need can come through a subscription. Far beyond Spotify and Netflix, companies in nearly any industry, from home contractors to florists, can build subscriptions into their business. Subscription is the key to increasing cash flow, igniting growth and boosting the value of your company. Whether you want to transform your entire business into a recurring revenue engine or just pick up an extra 5 per cent of sales growth, The Automatic Customer will be your secret weapon. John Warrillow, the author of Built to Sell, is the founder of The Value Builder System™ where advisors help company owners increase the value of their business. Previously, he founded Warrillow & Co., a subscription-based research business dedicated to helping Fortune 500 companies market to small business owners. A sought-after speaker and popular Inc.com columnist, he lives in Toronto. "Whether your business is exploding or stuck in a rut, there's something you can learn from John Warrillow in this book. Read, apply, and watch your bank deposits grow every month." "By page 40, The Automatic Customer will have you fundamentally reexamining your entire business. This is a brilliantly made case for why subscription revenue should be a part of every company. Highly recommended!" "It's rare that a book is able to have such a universal, immediate, and profound impact on the strategy of almost every business okay, every business. Warrillow's case for adding a recurring revenue stream to your business model is convincing and he shows you nine ways to do it, as well as how to navigate the potential pitfalls." "The Holy Grail in business today is the eternally loyal customer. The Automatic Customer is your blueprint for building a business that generates profit over and over again." "In this fantastic book, John Warrillow provides a clear path to turning your company from one that needs to start from scratch every month to one in which your work and, most important, your results, are predictable. If you want to build a business with a very healthy bottom line and extremely well-served customers, this book is an invaluable resource." Whether you want to transform your entire business into a recurring revenue engine or just pick up an extra 5 per cent of sales growth, The Automatic Customer will be your secret weapon. John knows what he is talking about. 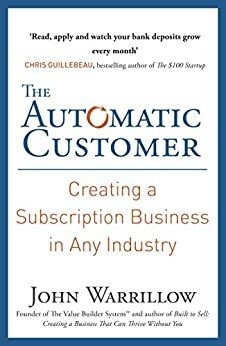 The Automatic Customer was spot on with how profitable businesses of the future will operate and John backs it up throughout the book with consistent examples and case studies of businesses that are thriving today with subscription models (some businesses you would never have thought would have Automatic Customers). this book certainly delivered the goods. Recommended for all business owners and entrepreneurs. A great book backed up by case studies and solid research. An enjoyable read. Synopsis: Subscription Biz models are here to stay in everything from software, to content to household consumables. 5.The Consumables Model: Selling products that naturally run out as a service, where ordering things can be a chore. Food, blades, vitamins etc. 6. Surprise Box Model: when you have a network that is willing to buy deeply discounted consumables from manufacturers at deep discount. The idea being some of the consumers will then order a subscription service at regular prices. 9. Peace of Mind Model: this is the insurance sale , where you pay for a peace of mind in the event you may need the service. He closes the book out with the new math of the subscription game with concents such as Customer acquisition cost, Monthly renewal rate, Life time Value of customer, Margins and Churn. The book is a good way to think about what models will work best in your industry / Excellent premier. If you are in a service biz or work with technology - BUY THE BOOK to learn the new language and math of business! What would have made it more powerful was a workbook or a step by step process to figure out which combinations of business models work best in the type of industries. Further commentary on the drawbacks of each model would have made this an invaluable text. Great case studies and concrete examples of 11 different MRR business models - monthly recurring revenue. The book gets you thinking in completely different ways about your revenues, your customers, your marketing, and most importantly - the future of your business using the subscription model. Buy this book - read it - and then implement a few of its "uncomfortable" ideas. Your bottom line will thank you for it. 5.0 out of 5 starsThis one will get your brain going. I bought this book simply to learn about the rising world of subscription businesses, not necessarily interested in creating one. After inhaling this book in a day, I've made important changes/additions to my business models. Timing couldn't have been better to read this. On my second business and organizing a global network of other young entrepreneurs, both of which will now include subscription models. Warrillow simply makes sense. His writing is easy. It's fun. It's worth your time. I even bought a copy for one of my clients. I recommend it for you too. I've read a LOT of books about starting and growing a business and every now and then one crosses my path that stops me in my tracks and makes me re-assess what I'm doing. 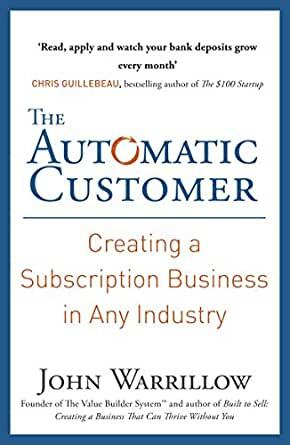 In The Automatic Customer, John Warrillow spells out the benefits of, and more importantly, the path towards creating a subscription based business model. I've had 2 x subscription businesses for a few years now so some of this was just affirmation and research for me. However, when it came to measuring the success of the subscription business model, Warrillow crystallizes exactly what you should be measuring and the benchmarks to aim for. This was music to my ears. He has clearly done his research (and references it for further reading - thank you) and distills the complexities of running a subscription based business into clear, actionable steps. This book was recommended to me by one of my students and I am eternally grateful. Our Director's meetings have a new agenda with new metrics and a whole new conversation about our viability threshold. 3) gives us the playbook on how to market, manage and grow subscription businesses. What sets this book apart is John Warrillow's credibility. He's done it. He successfully transformed a traditional business (sell the work/do the work) to a subscription model and then sold it. Combine this with his wealth of experience advising business owners and track record of authorship and you have the makings of a must-have book: The Automatic Customer. It has a wealth of practical and profitable ideas for business owners, whatever the existing business model.